What makes a good solar panel? This is the primary component of your array and your biggest investment. You should give this serious thought before choosing. There are hundreds of new panel manufacturers on the market today that were not here five years ago. Though they may have inexpensive panels and grand boasts of efficiency and quality, they are untested and most of the companies are located overseas. You may be able to save a few dollars today, but who will replace panels if they fail ten years from now? What Type of Panel is it? There are 3 Types of Panels. Thin Film or Amorphous silicon is the cheapest type of panels on the market and also the least efficient. Thin film panels are popular in utility grade settings since they are cheap and large ground mounted arrays do not need to worry about how much space they use. In residential settings or any time space is a concern, other panels are a better choice. You also have to consider the cost of racking. If a panel is less efficient, then you need more of them and hence, more racking and labor so in the end, it is not more competitively priced. Thin Film panels have a dull solid look. They have no wiring or grid on them and the entire panel is the same color. Monocrystalline silicon means the entire silicon wafer is center cut from a single silicon ingot. This is the most efficient method of making solar panels and generally the most expensive type of panels you can buy. 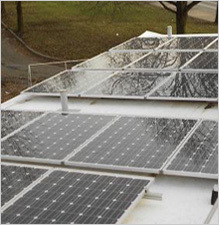 Since it is more efficient, you can use fewer panels and get the same result. These panels are also often cut from the best silicon and are generally more reliable and perform better in real world settings. Monocrystalline panels are easy to identify. They generally have a white pattern between each cell and small white diamonds at the corner of each cell. Energy Independent Solutions uses Monocrystalline Panels for most of our installations. Polycrystalline silicon is when they take all the parts and pieces from the monocrystalline cell production lines and use them to make a panel. These panels are very good, nearly as high quality as Monocrystalline. It is easy to tell them by sight; they will have a solid iridescent blue color and be striped with solder connections in a grid pattern. Do you know who manufactured it? About five years ago panel production machine prices dropped significantly with their introduction of small self‐contained micro plants. These machines can be purchased anywhere from $30,000 to $50,000 and part of the package is a guarantee that the panels will be accepted by the state of CA solar program. If a panel is accepted in CA, it is accepted throughout the US, including PA. Essentially this means a company can start producing panels in a garage somewhere today and stamp them with a 25 year warranty tomorrow. They have no track record and no way to back up their warranty but they still have the ability to sell on the US market. Considering the cost of the investment, ‘Buyer Beware’ is a huge understatement. – Choose a reputable Panel manufacturer. Have you heard of them? Is there more data than a fancy website? Can you call other folks like you who are actually using their product or do they just have bold product claims and a fancy website? Are they publically traded? Do they have public financials? – Make sure they have been around for more years than the warranty implies. If they started up 5 years ago, how can they predict the performance of the panels 25 or 30 years down the road? – Look at the method of manufacturing. Are they using compression to produce the panels without screws and attachments that canloosen over time? Are the contacts welded or screwed? Are the wires enclosed in solid plastic or are they attached loosely in a box to vibrate loose over time? We are biased here. Energy Independent Solutions only uses 100% American Made panels. We believe our money should be spent in our country to build our economy and create American Jobs. Many Chinese and Indonesian panels are on the market with no track records and no way to collect warranty claims down the road. They are cheap both in price and quality and we will not install them. Some companies claim to be American Made but do not actually manufacture in America. They only repackage here or re-label and then call it American Made. Don't be fooled by names. Be sure to research where the actual manufacturing takes place. Ensure the company has been around for enough time to make you feel comfortable they will be there if you have problems with the panels. How long is their warranty? – Does it last longer than they have been in business? – Does it drop in tiers or is it Linear meaning it prorates over time? Does your panel have a good ‘tolerance’ level? Each panel has a rated number of Watts it will produce in perfect laboratory conditions. These range run from +10% to ‐10% meaning a 100 Watt panels could produce 90Watts or 110Watts. Since you are paying for panels by the Watt it is important to know you are getting at or bettter than the rated Watts. – Look for panels that have a +‐3% or a ‐0%+3% or 5% rating. Some manufactures like SolarWorld use methods like Plus Sorting that ensure all panels outperform rated Watts. This ensures you get what you pay for and most times a little more. What are the ‘field performance’ ratings of the panels? Independent companies like Photon Magazine produce studies of installed Wattage versus actual installed field performance of panels each year. Some panels perform better than rated in actual real work conditions. Look for a panel that has scored high on this type of test. In the end this is the only test that matters since you will never have your panel in a laboratory. What makes a good racking system? – Is it a ‘solar engineered’ racking system or did your contractor pick up a bunch of parts from Home Depot and slap them together? Make sure you are getting a quality racking system that is either coming from a reputable racking company or has engineering documentation available. – Is it engineered for 90‐120mph wind loading and 25‐35 lb snow loading? What makes a good roof penetration? – What kind of roof sealant are they using? There are many ‘outdoor’ rated sealants but not all are created equal. You are building an array that you intend to have on your roof for the next 30 years. You need to ensure all parts of the installation are built with this in mind including the caulking. Make sure your contractor uses the highest quality caulking available, like Solar Seal. – Are they flashing the penetration or just using ‘L’ brackets? Flashing is critical on shingle roof installations. There are a very few contractors in Western PA that use flashing other than Energy Independent Solutions. Every installation we have seen othe than ours has attached the array to the roof using an ‘L’ bracket and no flashing. Once again, you are building something that will be on your roof for 30 years.You need the roof penetration to last that long and not leak. Simply attaching racking systems directly to a roof without using any flashing is irresponsible and will cause you problems down the road. You will be the one paying to have the array removed so it can be corrected. Ensure flashing is used on each penetration. Have the contractor provide pictures of other installations that show how they flash the penetrations. 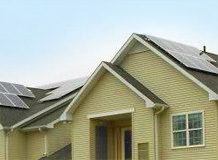 EIS Solar uses the best solar panels available in Pittsburgh. Our 100% American made solar panels have the best field performance in the industry and the best warranty available anywhere. That's why we only install Solar World Solar Panels on homes, businesses and farms throughout Pittsburgh and Western Pennsylvania. – Learn why our solar panels are the best in Pittsburgh and why you will earn a greater ROI with EIS Solar. Watch the solar video. Our high quality SMA solar panel inverters is another reason why we are the solar experts in Pittsburgh. EIS Solar Founder and President, Joe Morinville, steps you through the functionality of a solar inverter. – Learn why a quality SMA Inverter is one of the most important parts of your solar array. How we seal your roof is another EIS Difference! Watch this video to see the high-quality roof mounting products we use in the installation of your roof mounted solar array panels. – Get references who have similar installations and find out if they do what they say or if they are just giving you a sales pitch. What makes a good ground mounting system? The key to a good ground mount, beyond obvious racking quality issues, is making it maintenance free when it is done. The last thing you want to be doing is running lawnmowers and weed whackers under the array around the wiring or having to repeatedly paint the steel every year. – Ensure rock underlayment and a weed barrier is used to eliminate the need to mow and trim around the wiring under the array. – Ensure only galvanized steel, stainless steel and structural aluminum is used in the structure so you will not need to repaint year after year. – Ensure the concrete piers or foundation points are finished and tapered so water does not pool around posts allowing ice and water to damage the connection to the ground. – Ensure all wiring is lightly attached to the racking system so it will not rub and wear when the wind blows.